Beef it’s what’s for lunch at Jordan Public School in Garfield County, Mont. Seven beef steers raised by local Montana ranchers were donated to the 130-student K-12 school, and students and faculty have enjoyed a wide array of tasty dishes ranging from hamburger pizza, meatloaf, beef and gravy over mashed potatoes, and cheese burgers. Jordan Public School Superintendent Nate Olson said faculty members teamed up to explore options to bring better beef into the school. Through the support of these six ranchers including Lee and Toni Murnion, Bryan and Chelsea Phipps, Rick and Earline Lawrence, Colin and Carrie Murnion, Philip and Karen Gibbs, and Brent and Hillari McRae, students have enjoyed locally-raised beef this school year. The school has also received support from Garfield County Bank and Ryan’s Processing Plant. Olson explained the steps the school had to take in order to make this happen. As the school year wraps up, students were treated to a prime rib meal at the junior/senior banquet. The seniors will enjoy a steak fry on their last day of school. Hageman said with his many activities such as student council, football, basketball, Business Professionals of America, and FCCLA, a nutritious lunch is important to him. 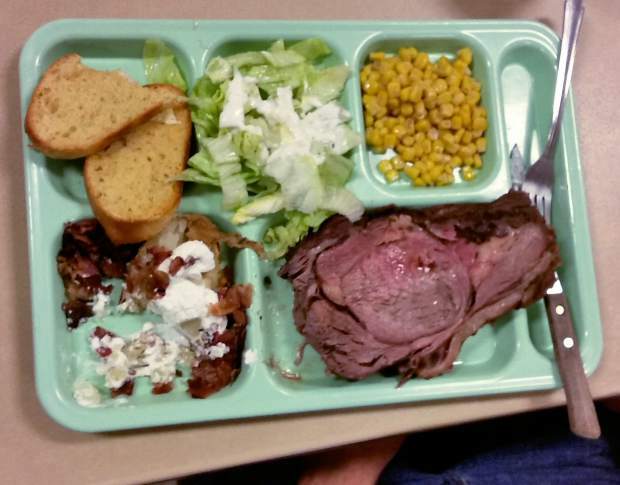 Olson admitted that it’s not always easy serving locally-processed beef in the school. In addition to the eight steers lined up for next year, Jordan Public School has also lined up donations for local pork, so the kids will have access to pork chops, hot dogs and breakfast sausage. While some schools have opted out of the federal school lunch program, the Farm to School program is supported by the USDA. The term “farm to school” centers around connecting local farmers with students to teach them about where their food comes from, while also expanding market opportunities for food producers. In 2015, the Farm to School served over 18,000 public, private and charter school districts in the U.S. According to the 2015 USDA Census, 42 percent of school districts say they participate in farm to school activities such as serving locally produced foods in the cafeteria, promoting locally produced foods at school, holding taste-testing demos in the classroom of locally produced foods, going on field trips to farms and orchards, and utilizing new strategies to encourage the consumption of local foods. Aubree Roth, Montana State Lead Farm to School coordinator says the “beef to school” trend has been growing rapidly in the state. Through the grant, Roth has been studying several Montana schools that serve Montana-raised beef. Roth said it’s important to note that the schools aren’t giving up federal funding to buy local beef, in fact, it’s encouraged. What’s more, because of the Buy American Provision, the federally-funded program is required to buy American grown and raised products whenever possible. Roth is currently gearing up for the Montana Farm to School Summit, which encourages school administrators, parents, students, community members, farmers and ranchers to come together to learn more about how to get locally-sourced foods into school lunch programs. According to an opinion piece by Heather Fryer, the Summit, scheduled for Sept. 22-23, will feature field trips to successful schools, processors and school gardens in the Bozeman area and breakout sessions to help schools gather resources and ask questions. For more information on the 2016 Montana Farm to School Summit, check out https://tofu.msu.montana.edu/cs/f2s_2016.